Since I have no choice but to have a "fresh start" in my new classroom, I decided that I would overhaul everything. 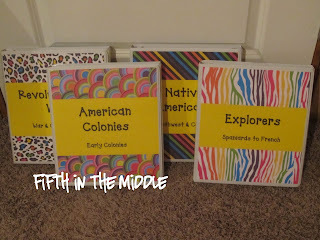 Looking around in blogland, and especially Pinterest, I feel a little pressured to have a classroom "theme." In my thirteen years of teaching, none of my coworkers or I had ever had a theme. Maybe it was because only fourth and fifth grades were in my building, and available pre-packaged themes seemed a little too primary. But it seems that a theme doesn't have to be things like teddy bears or giraffes. It can simply be a color scheme. 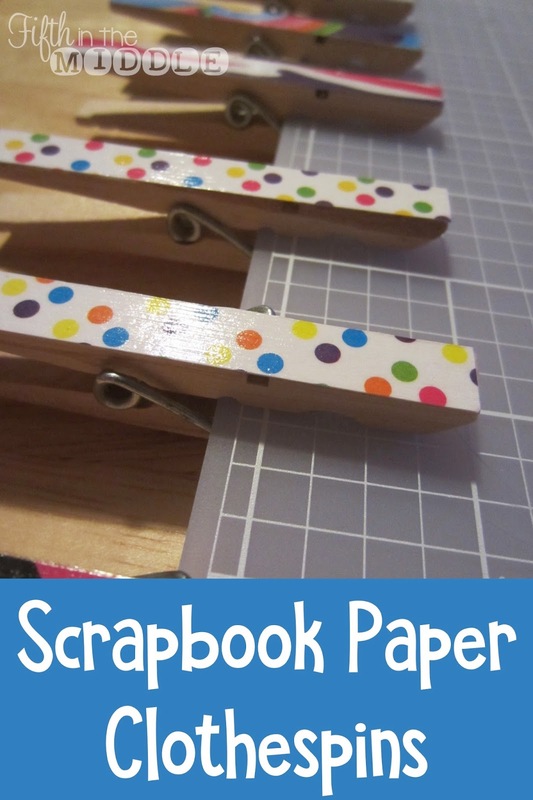 When I saw this package of scrapbook paper at Michael's, I thought that it would be a good basis for my classroom. It's bright, it's fun, and not too little kiddish. So after searching through my pinned school project ideas, I decided to start with making new inserts for my binders. I can't find the online source of my inspiration, but here is the finished project. To get this to work out, I had to print on the solid paper in the landscape format then trim to fit the width of the cover. Then I cut the patterned paper so that it overlapped with the solid paper by a centimeter or so and glued the three pieces of paper together. The label for the spine is a repeat of the binder title, but in one line. 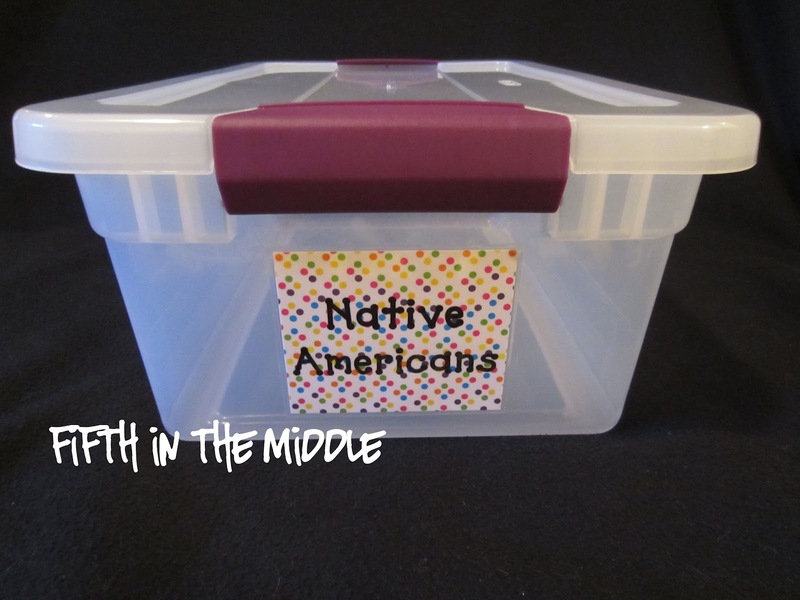 While I was at it, I made labels for my tubs. Of course, I laminated them and stuck them on using my sticker maker. My next project was the DIY ruler holder from Classroom DIY. The only changes that I made to the instructions were to use Mod Podge instead of the spray adhesive (which I didn't have) and I trimmed the paper prior to adhering it. I also used Mod Podge to protect the paper and used the Mod Podge clear acrylic sealer to get rid of the tackiness. I had a bunch of empty formula canisters around, so I decided to do those as well. Now that I think about it, my scrapbook paper was 8 1/2 x 11, so it wouldn't cover the Pringles can. I took two strips of coordinating paper to use at the top and bottom. The formula can needed one and one-half pieces of paper to get total coverage. 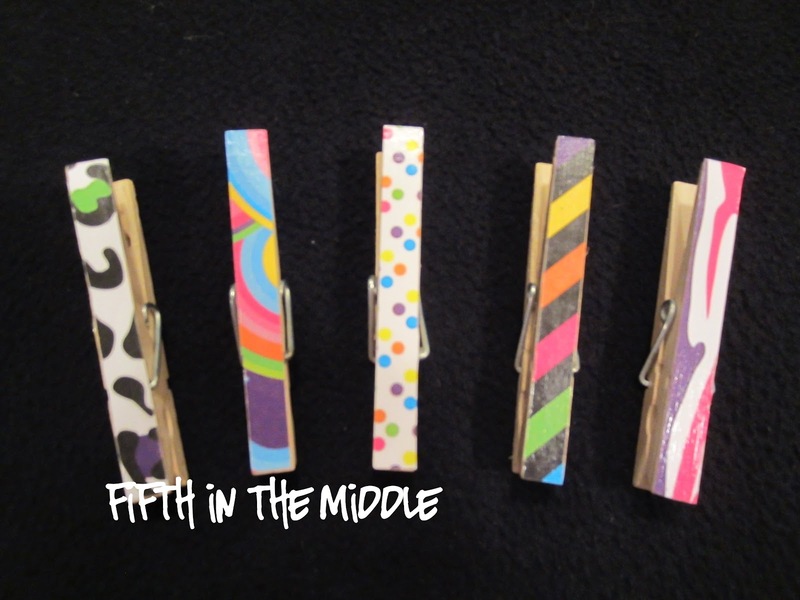 Next up was clothespins covered with the scraps of paper that I had generated up to this point. This inspiration came from a pin from Etsy. 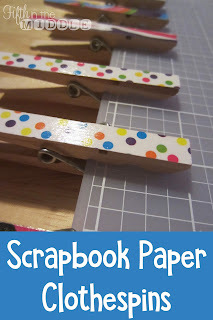 I started by Mod Podging clothespins to the scrapbook paper. I lined it up so that two edges were aligned with the edges of the paper so that I only had to cut two sides. When they were dry, I used my craft knife to cut along the tip and far side. Then I clipped them to my cutting mat and gave them a few coats of Mod Podge. So, that's been keeping me busy this summer. Now trying to figure out what curtains fabric will go with all of these bright colors! I referred to it in my previous post, but it will put a sticky residue on the back of any flat object up to 5" wide. So after I made my labels and laminated them, I put them through the machine and it made the back sticky so I could stick it to the tub. It's so much fun! I found you on Made it Monday linky! I love to connect with other inspiring teachers! I am your newest follower! Very cute projects. I love the bright colors! I'm your newest follower and would love for you to check out my blog! your theme is FUN FUN FUN!!!!! Wow, I love all of your projects!! 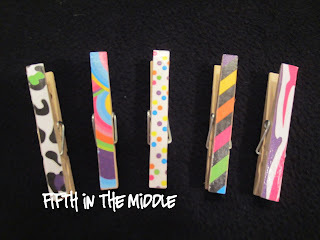 The colors are wonderful:)) I applaud you for your clothespins, they look fantastic and that is a lot of work! Can't wait to see it all together! Mahalo for linking up. Thank you! Hope your first day was great! Thanks! I'm following you back :) Always excited to find other fifth grade teachers! Love your colors! 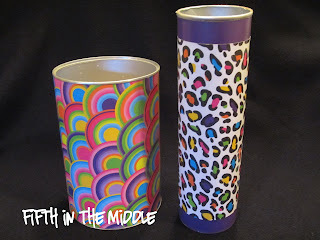 Thank you for giving me the how to for covering pringles cans! I always tried to match up the paper, with little success! I'm your newest follower, I'm still working on my Monday Made It projects! I tried to match up as well, but I'm very particular and it would bug me if it wasn't quite right :) Looking forward to seeing your projects! I really like your projects. 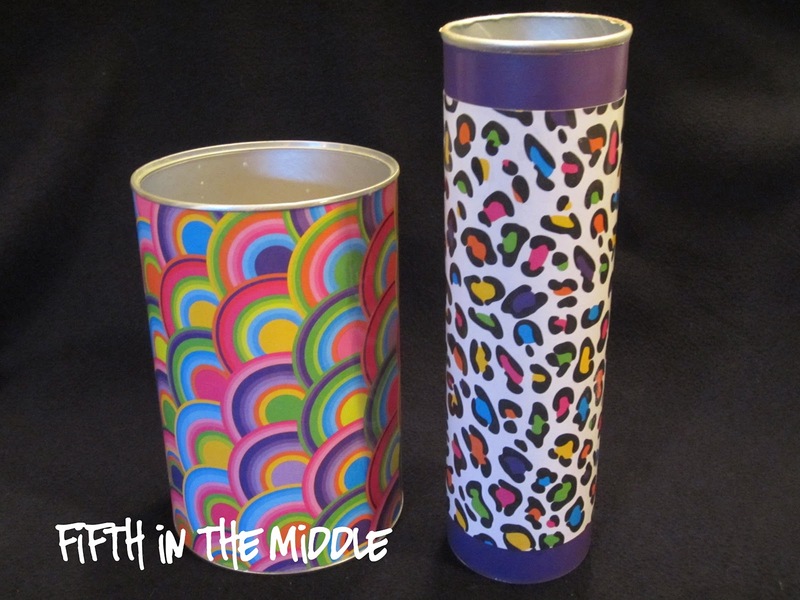 I found your blog on Made it Monday! I have been teaching for 18 years, but this year will be my first in 5th grade. I love looking for inspiration, so I am your newest follower. Come see mine! Thank you! Checked out your blog - love the new room color! So a technical question, how did you get My Journey to 5th Grade as a hyperlink in your comment? Great ideas! 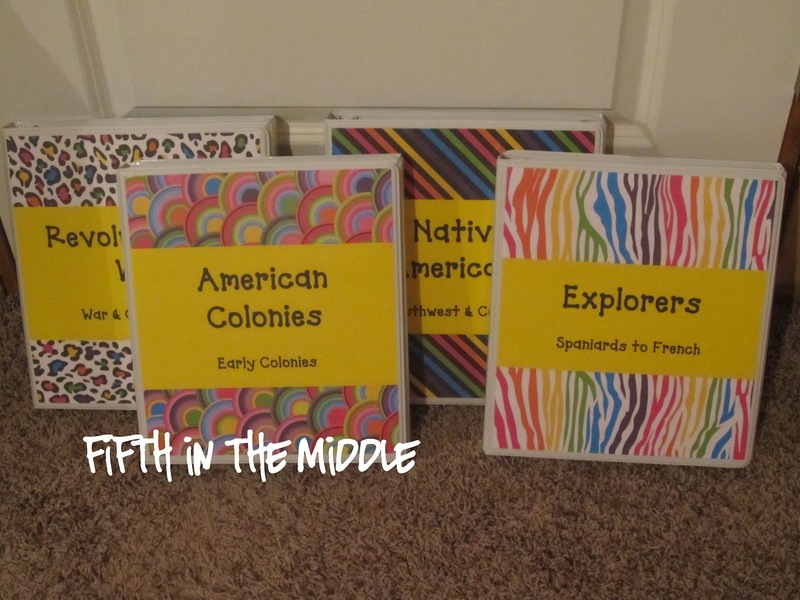 I taught 6th grade 2 years and didn't know much about classroom themes...But, then I was bitten by the Teacher Blog Bug and you know the rest...I have finally decided on a Learning Safari (Wild Animal Kingdom)theme for my new class of 4th graders...I can't get into the room for a couple weeks so for now it's blog hopping for more ideas...Check out my new blog at www.missmiltonsmemoirs.blogspot.com when you get a chance! I love all of the bright colors you used in your projects. I'm your newest follower. Thanks! I'm following you as well! Just found this post and love your theme. I'd love to see more pictures of what your curtains turned out to be! My theme is zebra and hot pink this year in 4th and even the boys like it! :) I'm your newest follower! I didn't end up doing curtains. Turns out long window x fabric = expensive project!